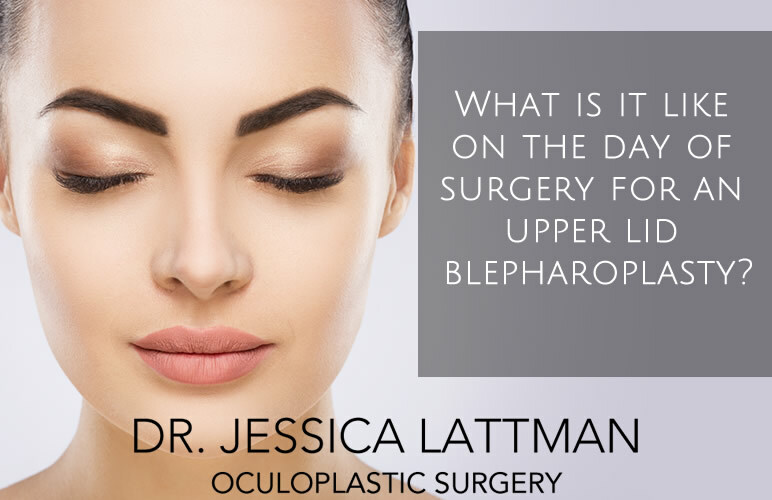 Q: What is it like on the day of surgery for an upper lid blepharoplasty? A: Before scheduling the procedure, I will discuss with you options about where you would like to have it done. There are two options: 1. In the OR 2. In the office If you are medically well, then the office is a great choice for an upper lid blepharoplasty. You will come into the office, after eating a normal breakfast. When you get to the office, you have the option of taking a medication to help you relax, this is a pill. No IV or needles required. If you choose to have the procedure in the OR, you will come to my surgical center and receive IV sedation by our anesthesiologist. I will come into the room and we will go over the surgery and I will mark your upper eyelids with a surgical marking pen. Then you will lie flat in the procedure chair and I will inject a small amount of lidocaine into the upper eyelid skin to make it numb. The nurse will clean your face to make it sterile and place sterile drapes around your head. Then I will start the procedure. Once I start it takes about 30 minutes of actual operating time. All you have to do is relax. We can play music or talk. Whatever makes you most comfortable. If you have IV sedation in the OR, you will take a short nap and wake up when it is over. When I am done, you will sit with ice compresses on your eyelids for about 20 minutes, and then someone will need to come and pick you up. Most patients have little to no pain after the surgery. Upper lid blepharoplasty is a great way to get rid of upper lid heaviness and hooding. You get a fresh new set of eyelids!